The KHR team were able to get together on Friday at our Linton Office. 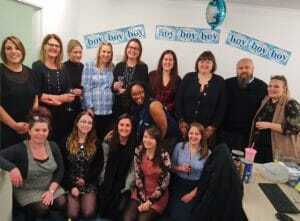 15 of the 20 strong KHR team were able to get together on Friday to give Senior Lead Consultant, Nicola her surprise maternity leave send-off. Jane and her team travelled over from Tunbridge Wells whilst Sonia and her team travelled over from Leybourne. As Nicola came out of her meeting, everyone was there armed with gifts!